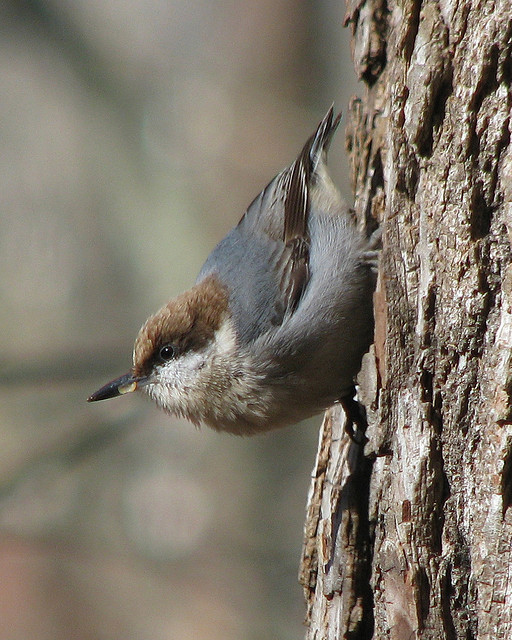 Many Brown-headed Nuthatches make their home in the tall longleaf pines of the Apalachicola National Forest in Florida. Twittering constantly, the birds probe for tiny insects or extract seeds from cones in the trees’ upper branches. Forests of longleaf pine once dominated the sandy coastal plain from Virginia to Texas, but the tall, straight pines proved irresistible for their lumber. Now, much of the forest is gone, replaced by dense planted stands of quicker-growing slash pines. As our population grows, and more and more land is devoted to human uses, our national forests become increasingly important for birds, both rare and common. We’re hearing the calls of Brown-headed Nuthatches, moving through the tall longleaf pines of the Apalachicola National Forest in Florida. Twittering constantly, the birds probe for tiny insects or extract seeds from cones in the trees’ upper branches. Forests of longleaf pine once dominated the sandy coastal plain from Virginia to Texas, but the tall, straight pines proved irresistible for lumber. Now, much of the forest is gone, replaced by dense planted stands of quicker-growing slash pines. The remaining longleaf pine habitat supports a great diversity of plants and animals. [Bachman’s Sparrow song] Many are found nowhere else, like the Bachman’s Sparrow [Bachman’s Sparrow song] and the endangered Red-cockaded Woodpecker [calls of small flock of Red-cockaded Woodpeckers]. The Brown-headed Nuthatches foraging here are tool users. A bird will break off a flake of pine bark and use it to pry up another flake to expose the insect hidden beneath it. As our population grows, and more and more land is devoted to human uses, our national forests, like Apalachicola, become increasingly important for birds, both rare and common. Bird sounds on BirdNote come from The Macaulay Library at the Cornell Lab of Ornithology. For BirdNote, I’m Michael Stein. Bird Sounds provided by The Macaulay Library of Natural Sounds at the Cornell Lab of Ornithology, Ithaca, New York. Brown-headed Nuthatch calls 40782 recorded by G.F. Budney; calls of small flock of Brown-headed Nuthatches 31538 recorded by O. Hewitt; song of Bachman’s Sparrow 138359 recorded by G.F. Budney; Red-cockaded Woodpecker 105749 calls by G.A.Keller. Bachman’s Sparrow (and others) in Apalachicola National Forest 105747 recorded by G.A. Keller.